Remove the rear wheel. Refer to “rear wheel assembly removal and installation” in section 2d . Drain brake fluid. Refer to “brake fluid replacement” in section 4a . Remove the brake hose from the caliper by removing the union bolt (1) and catch the brake fluid in a suitable receptacle. Remove the brake pads. Refer to “rear brake pad replacement” . place a rag underneath the union bolt on the brake caliper to catch any spilt brake fluid. 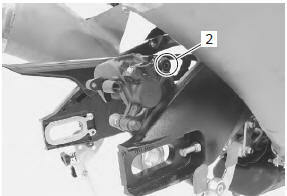 Remove the caliper by removing the sliding pin a (2). 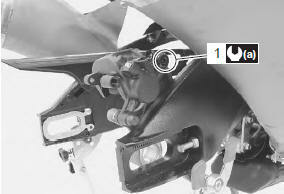 Remove the caliper bracket (3) from the swingarm. Install the brake caliper in the reverse order of removal. apply grease to the sliding pins. Tighten the caliper sliding pin a (1) to the specified torque. Fit each boot end into the sliding pin groove. Install the rear wheel. Refer to “rear wheel assembly removal and installation” in section 2d . Install the brake pads. Refer to “rear brake pad replacement” . 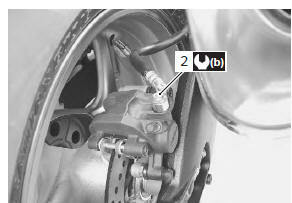 After setting the brake hose union to the stopper, tighten the union bolt (2) to the specified torque. the seal washers should be replaced with the new ones to prevent fluid leakage. Bleed air from the brake system after installing the caliper. Refer to “air bleeding from brake fluid circuit” in section 4a . Check the brake fluid leakage and brake operation. leaks, will interfere with safe running and discolor painted surfaces. Check the brake hose and hose joints for cracks and fluid leakage.